Article for Project Baltia magazine (No 28. 02/16; 03/16) about the competition for the memorial dedicated to the victims of communism in Estonia. The Polish poet and Nobel Prize laureate Wisława Szymborska has writen a touching poem called Children of Our Age in which we find the following lines: "Even when you take to the woods, / you’re taking political steps / on political grounds." She was referring to the 20th century during which even the wild berries in the woods became political. This all-pervasive sphere of politics is certainly unavoidable when we speak about yet another monument in the Baltic Sea region. This time it is a memorial dedicated to the victims of communism to be erected in Tallinn next to what once used to be the main Soviet Estonian monument dedicated to the Second World War. But what if we could sometimes leave the ideological mumbo jumbo behind and just pick yummy berries on usual grounds? I think this is what Villem Tomiste from Stuudio Tallinn (ex Kosmos) proposed with his project for the memorial's design competition. His imaginative Bolder seemed to be saying: forget about the dry and sterile etiquette of how a memorial should look like, let's get wild, let's get... natural! But before I get to the details, I nevertheless need to give the reader some mundane background information. Maarjamäe lies five kilometres east of the old town, righ on the coast of Tallinn bay. Count Anatoly Orlov-Davydov built himself a pseudo-Gothic residence here in the late 19th century. Nowadays this complex of buildings houses the Estonian History Museum. Interestingly the museum's backyard happens to be the "graveyard" of Soviet monuments which were lucky enough to escape destruction after 1991. Just next to Orlov's palace the Soviet rulers erected a central memorial dedicated to the Second World War. Only the first phase of the magnificent design by Allan Murdmaa was finished. Even though it was an extremely political monument, its liberal design differed greatly from the other memorials found in the Soviet Union. The architect succeeded in letting the pure Modernist aesthetics (associated with the architecture of independent Estonia) dominate over the ideological content. In 1989 an elegant monument dedicated to Charles Leroux – a pioneering aviator who tragically died while presenting parachuting to an amazed local crowd – was erected nearby. Tõnis Vint has observed that due to these and other monuments dedicated to the drowned and the dead (Russalka by Amandus Adamson, 1902; The Broken Line Monument by Villu Jaanisoo, Jorma Mukala, 1996) Tallinn's sea-side has an essentially morbid, death-obsessed genius loci. To make things worse – Maarjamäe was the place where the both communists and Nazis buried their dead in 1941 and 1944. One can imagine the tensions in this ground: every step is political indeed. Some years ago the Memento Association (unites foundations which deals with the people repressed by the communist regime) started looking for a right place for the monument dedicated to the victims of communism. Learning from the Estonian "war of monuments" they began in a welcomingly open-minded fashion. The design competition's first phase was an exceedingly broad "fair of ideas" where contestants could suggest absolutely any place or idea which they had in mind. To be honest the outcome was a failure, as only a few fresh concepts were suggested. Probably one of the reasons why the competition failed is because of the universal crises of monumentality. There simply are no good examples of how a contemporary monument should look and act like. At any rate the Memento Association chose Maarjamäe to be the setting for the second phase of the design competition. Tallinn-based architecture studio JRV won the competition. Their proposal has a clear idea, chic architectural language, a bit of drama, a fair amount of universal symbols and a religious sentiment. This is all very nice and calm, but at the same time safe and dull. Basic ideological tools won the day – their project perfectly fulfilled all the expectations of the jury. But apart from this, it lacks life! It lacks wild berries, it lacks wilderness, it lacks the hope that somewhere there is an unpolitical square metre in the woods! All of the designs proposals – except Stuudio Tallinn's project – failed. Villem Tomiste described his enigmatic Boulder in the following words: "The memorial is a bolder – a huge ferroconcrete sphere covered by plants and birds' nests. From inside the bolder is as hollow as Communism. Yet the boulder has a few openings from where the sun will fill the space with some light and hope. A boulder is a clumsy material from oversees which eventually becomes part of the local habitat. It forms a unity together with the other sacred stones in Estonia. Thanks to its simplicity it integrates easily into the Maarjamäe complex. It will stand in the shade of trees as boulders usually do." What a crazy, self ironical and inspiring take on the topic! Sadly such concepts hardly ever win competitions. 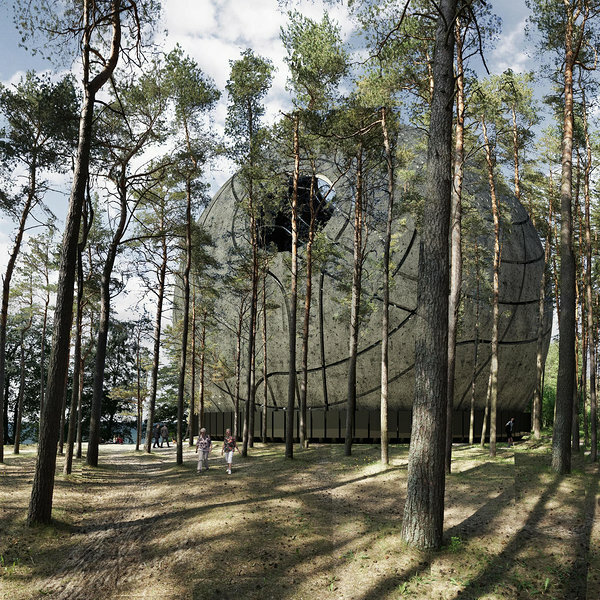 Though as the Estonian National Museum's case exemplified, a progressive and self-confident (cynical?) sometimes makes these things happen. Tomiste's Bolder avoids the usual discourses people tend to use when speaking about "the short 20th century" (E. Hobsbawm). I can imagine a hundred people walking into the Boulder and in their minds addressing the collective memory in a hundred different ways. If this sounds like an ultimate Postmodern post-semiotic liquid space, then don't worry, just around the corner there would be the other monuments taking the lost people back on track of the old grand narratives. K. Brüggemann ja A. Kasekamp, The politics of history and the "war of monuments" in Estonia. – Nationalities Papers 36 (3), lk 425–448.